Learning how to count money, calculate expenses and the value of savings is one of the most important lessons that a child can learn, as the habits that he forms regarding spending and saving during these formative years are likely to follow him into adulthood. There are a variety of books, websites and games devoted to helping kids acquire these essential skills, but the advent of the smartphone has helped to change the way that we pass lessons along to our children as well. These ten iPhone applications are available in the App Store, and can supplement your own teaching methods. Kids Money – This free app from Apps Rocket is billed as a pocket money calculator for kids, helping the smaller set budget for the purchases they hope to make. In addition to helping kids figure out what they can afford to buy with the money they already have, it also calculates when they’ll be able to afford a larger purchase should they hold to an established savings pattern. P2K Money – Created specifically to help parents and kids discuss money in a helpful, learning-experience dialogue, P2K Money is a free offering with strong teaching power. By tracking income and expenses, offering a wishlist function and a history of all wishlist goals that have been reached, this app both motivates and teaches youngsters about the power of wise spending. Save! The Game – This game from MassMutual is described as a 3D adventure game, but helps kids learn the power of saving and the importance of avoiding impulse buys through play. The object of the game is saving, pairing interactive fun with real-life lessons that turn into talking points for parents and kids later. Bank of Mom – Consistently named on a variety of iPhone App Top Ten lists, Bank of Mom helps parents and kids keep track of younger family members’ spending habits and foster a sense of understanding in a world where cash is less and less common. Grasping the abstract concept of money when it’s rarely seen in tangible form can be difficult, Bank of Mom seeks to remedy that problem. Coin Math App – The first step to understanding how to manage and save money is learning how to count it. This is where Coin Math comes in handy, helping younger kids grasp rudimentary spending while also boosting general addition and subtraction skills and teaching coin recognition skills. 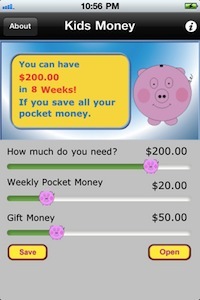 Savings Spree – Helping kids understand the impact of small, everyday purchases on their savings is the aim of Savings Spree, a $2.99 app from developers Money Savvy Generation. Winner of both a Parents’ Choice Gold Awared and the Editor’s Choice Award from Childrens Technology Review, this highly-rated and oft-recommended app may be just the thing you’re looking for to help your youngster acquire responsible spending habits. Chore Bank – For kids whose income is part of a chore-based household economy, Chore Bank is a great way to help them understand the correlation between completing designated tasks and receiving compensation. Parents can also set interest rates for kids’ savings, helping them further grasp the value of saving versus impulsive spending. Count Money –Not only does Count Money help kids recognize various currency and calculate its value; it also offers the option of doing so in Mom or Dad’s recorded voice. The familiarity of your voice, paired with an audio hints option, can boost kids’ retention and help them understand the basics of money management: recognizing the value of currency. A+ Allowance – Parents can set a weekly allowance amount, assign different values to different chores, manage kids’ chore lists and add more chores to specific days with A+ Allowance. Kid users can use the app to determine how much they’ve earned, watch their savings accound grow and check off each chore as they complete it as a motivational tool. Tykoon –Highly customizable and designed to fit the needs of families from all walks of life, Tykoon operates under the theory that learning money management and financial values is of the utmost importance to the younger generation. Chores, rewards, savings and charitable contributions can all be handled through this powerful free app, just to name a handful of the features. Regardless of their power and scope, no iPhone app can compete with the teaching power of a parent. Remember that your kids will learn the financial planning and money management skills that they use in adulthood from you during these formative years, and that it’s never to early to start instilling good spending habits.